Back to reality...sort of. Recently, I attended the Games for Change Festival at the Parsons School of Design at The New School in New York City. The 14th installment of this annual event that brings together people who make video games to help society, people, and health also included a one-day Virtual Reality (VR) for Change Summit on August 2. And this VR Summit showed just how much of a reality VR for health care is becoming. As Susanna Pollack, President of Games for Change, explained, "The VR portion of the Festival is new. The Games for Change Festival started with 40 or so people in a conference room who realized that video games offer a way to connect with audiences and reach audiences that are tough to reach. Now we have over 1100 people attending." The festival concluded with a cocktail reception at VR World NYC that included VR games, sushi, and beer...which for some people is the definition of Nirvana. Indeed, the prospect of playing video games to help people may seem sort of like eating healthy molten lava chocolate cake. Combining indulgent fun with health benefits is just desserts for anyone who was told while growing up that playing video games is bad for you. Previously, many gamers have had to argue the indirect benefits of playing such as improving hand eye coordination (as described in this study published in Psychological Science) and problem solving skills while stealing cars (Grand Theft Auto), gathering abnormally large mushrooms (Super Mario Brothers), avoiding a massive gorilla who seems to have an endless supply of barrels (Donkey Kong), or saving the Universe (Halo). Note: the saving the universe argument doesn't work with parents. But now there are more and more video games explicitly being designed to improve health. For example, I wrote previously for Forbes about how Amblyotech and Ubisoft are introducing Dig Rush to help kids with "lazy eye" or amblyopia. Now, while there isn't yet a "rush" to develop video games for health (certainly compared to the much larger overall video game market), efforts are growing. But bringing VR gaming to health care is an additional step beyond bringing video gaming in general. For those of you imagining Dr. Beverly Crusher in the holodeck on Star Trek: The Next Generation, VR technology is not quite there yet. 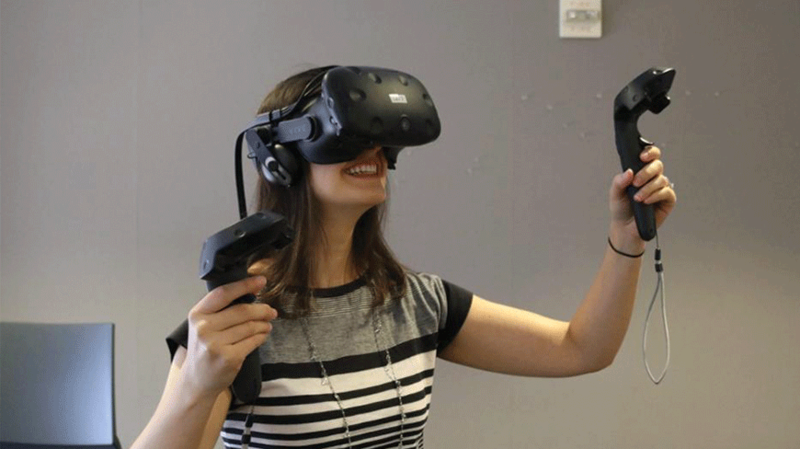 As Leigh Christie, who directs the Isobar NowLab for North and South America, explained, "The headsets currently used in VR are still bulky and not the most comfortable, and the visual presentation and interactivity continue to improve." Some health care professionals can be quite exacting when something doesn't look, feel, or even smell exactly like the real thing. (Game developers, leaving out the actual smell of vomit in a VR game is probably OK.) While there are obstacles, both real and virtual, to overcome before VR can become more mainstream in health care, the Games for Change Festival did showcase some apps that are starting to make a difference. One example is Isobar's Common Ground VR. This game aims to simulate...at least for a little bit...what it's like to have a visual disability like macular degeneration or glaucoma or a disability that restricts your ability to reach (e.g., being in a wheelchair). This way you can see how difficult it is to do things that you may take for granted, like going shopping. As Christie explained, "Playing this game can help not only increase empathy but also help determine what assistance and treatments are needed." Another example is Kognito's simulation game in which you can play roles such as someone talking to a child about substance abuse, a student potentially in psychological distress, a person contemplating suicide, or a patient who isn't compliant with taking medications, as described in a publication in the journal mHealth. Ron Goldman, co-founder and CEO of Kognito explained, "By providing players with hands-on practice in navigating critical health conversations with virtual, fully animated virtual humans, we are able to build their confidence and skills to lead similar conversation in real life." VR and video gaming in general could virtually transform health education in many settings. For example, Breakaway, Ltd, has been working with partners to develop simulation platforms such as Pediatric Sim, a game that teaches and assesses performances on 7 different pediatric emergency scenarios (anaphylaxis, bronchiolitis, diabetic ketoacidosis, respiratory failure, seizure, septic shock and supraventricular tachycardia) and the USC Standard Patient Studio that allows you to talk to different types of patients that visit you in a virtual doctor's office. One could easily how such games could morph more and more into VR games that get closer and closer to "real" interactions. What then are the biggest obstacles preventing VR from becoming more of a presence in health care (besides head sets that feel like an octopus is clinging to your head)? The 3 A's: awareness, acceptance, and aw, come on, why aren't more people investing in this? Not everyone in health care is aware of the great potential of VR. Adoption of new technologies and forms of education can be slow in health care, especially if upfront investment is required. Moreover, as Pollack described, "There needs to be balance between commercialization, health and social impact, and discoverability. Many of these game developers are competing against larger manufacturers with multi-million dollar production budgets." Currently, it may seem easier and more profitable to develop a game where you can shoot everything around you or that's the umpteenth sequel to an already popular video game line (e.g., as of 2016, the video game character Mario has been a centerpiece of 119 different video games). What then will it take to get more VR nurse Marios or Dr. Donkey Kongs? More investment to develop more games to help people see (and touch) the potential value of VR. It's not as if people in the 1970's said that we really need a way to eat dots on a video screen while creatures that look like large heads of hair chase you around a maze. The creation of the PacMan by the Japanese company Namco in 1980 then led people to realize that they could spend entire afternoons doing nothing but that...and real money could be earned. Similarly, more initial success stories could bolster interest and expand the market. At this time, investors such as venture capitalists may not see the multiples of return to attract them. However, other funders such as the National Institutes of Health (NIH), Department of Defense, healthcare entities, and angel investors who are not necessarily beholden to as quick returns-on-investment could jump start the VR "revolution" in health care. It's a question of when and not if the VR "revolution" will occur in health care. Eventually, there will be smaller, less Octopus-like, more convenient, and less expensive VR headsets or glasses. Eventually, the presentation will become closer and closer to the Star Trek holodeck. Eventually, VR can help overcome the tremendous costs and logistical challenges of real patients and allow more innovative ways of remote training. Eventually, more people will recognize the potential positive impact of VR, which the annual Games for Change festival is helping accomplish. Eventually, VR will become a much more common reality in health care. Consider that a virtual certainty.